Big Easy seafood restaurant is located at 1915 Central Expy #200, Plano, TX 75075. 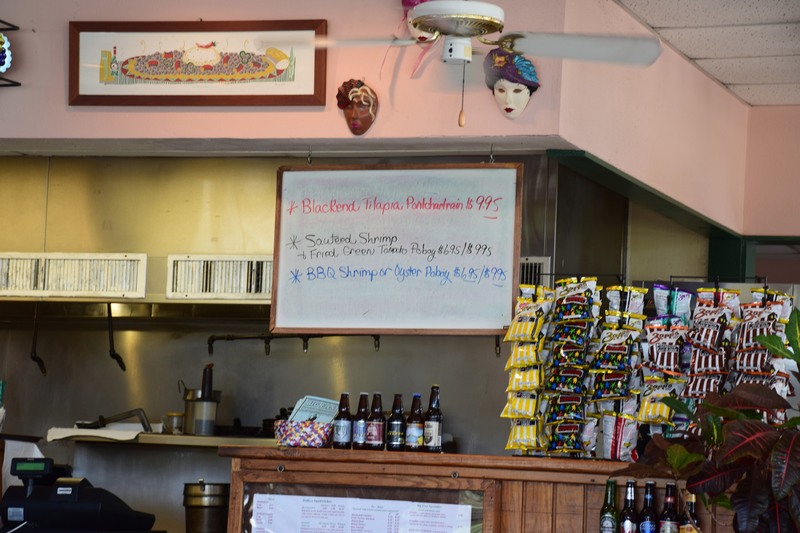 Situated in a very nondescript strip mall, this no-frills eatery has a nice selection of grilled, fried and stewed dishes. As you walk up to the bar to order, you are greeted by a board listing the daily specials. The full menu is haphazardly displayed behind a somewhat worn class sheet affixed to the lower part of the bar. Not dissuaded by the lack of organization of the menu, I ordered the 6 inch oyster poboy, a cup of the seafood gumbo, a piece of the crawfish pie and an Abita Restoration ale. I paid via Amex and waited for my number to be called. Within a few minutes, my food was ready, and I was at my small cafe style table ready to chow down. First up was the seafood gumbo. If a New Orleans style restaurant is unable to produce a decent gumbo, there is no reason to try anything else. I judge the quality of all gumbo on three broad points: Color, consistency and taste. For me, the perfect gumbo should have a color similar to that of a dark brown paper bag. This one passed the color test with, well… flying colors. Next up was the assessment of consistency broth. I have never been a big fan of thick gumbos. It has been my experience that if a gumbo is too thick, it takes on the flour taste of the roux. Unfortunately, this one was too thick and that distracting flour taste was noticeable but not overpowering. The gumbo also fell short on the overall quantity of seafood. There were a few small to medium size shrimp and a couple of small bits of crab, but could have used about 30% more to make it a great dish. Next up, I tried the crawfish pie. This dish has quite a few different iterations, so you never really know what you are going to get. In this case, the pie took on the shape and feel of an empanada. It was thin crescent shaped dough, stuffed with a thick roux, onion and tomato type mixture that was then deep fried. There was great potential in this dish, but it had a bit of a fridge/freezer aftertaste to it. I suspect that these were either previously frozen or the dough sat in the fridge too long and picked up some gnarly flavors from whatever was around it. This was truly unfortunate, because the dish was perfectly cooked and could have been really great. Finally, I dug into my oyster poboy. This was truly the star of the meal. The baguette was fresh and perfectly executed. The crust was thin and crunchy and the overall texture of the interior was toothy and perfect for the sandwich. The oysters were big, fresh and plentiful. They were cooked perfectly, breaded in cornmeal and seasoned just right. The accompanying lettuce was shredded and the tomatoes were cut to the perfect size. 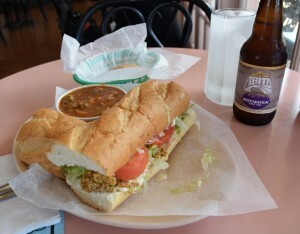 This was a really good poboy, and I would certainly recommend it to anyone that stops in a the Big Easy. Overall, I would give this place 3 1/2 stars. It was good but not great. The gumbo and crawfish pie were less than stellar, but the poboys are well executed. I wouldn’t make a special trip to eat at this place, but if I was in the area I would go back.